Let us help you enjoy this holiday a little bit more this year. Ditch the store. Grab a coffee or glass of wine and jump on that computer. We have so many items to make your holiday more easier. The only thing that we are not able to bring is the bird. Although, if you are having a small Thanksgiving, our 4 lb whole chickens can surely fill the spot. Oh Thanksgiving. What a wonderful, tasty, and completely stressful holiday you are. I mean what other holiday can you enjoy a feast with your family and have a cute grandma flip you the bird (not a turkey) because she doesn’t like the way you’re driving in a crowded grocery parking lot? Fun times. But this week, as I do every year this week, I want to focus the newsletter on the idea of community. And to seed this newsletter, I want to share with you a very concise email I received from one of our members this week, “I love Dion’s and Einstein Bagels, but am curious how both fit in with your organic food model?” And let me say that I feel so fortunate to have such a close connection to our members; I get to hear when folks are happy, sad, or just looking for clarification. I do not shield myself from this and I appreciate the feedback. So let’s look at this email. 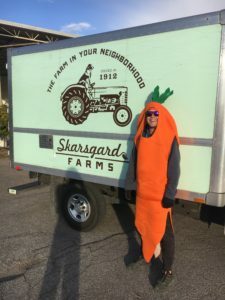 To begin with, I do not think that we can even categorize our mission as an “Organic food model.” We provide our members with over 10,000 lbs of Organic produce a week, but we also offer a lot more than that. None of our meat is “Certified Organic” because honestly I feel that we found incredible ranchers who do a better job than just labeling it as Organic. Our bakers are baking your goodies at 3 in the morning for you. No additives, preservatives, and the bread is still warm when they get to the warehouse for your delivery. But they are not Organic. Our dairy cows have no hormones, range on pasture, and enjoy the New Mexican sun like we all do. But they are not certified Organic. What I am getting at folks is that I love the Organic label. So thrilled that we have an Organic label in our marketplace, but I feel that our mission and work has transcended Organics. I do not say that in a pompous or arrogant way. What I mean is that through our dedication to this community and to the local food movement, I think we have outgrown the boundaries of a simple label. Think about this way, when you are lost in a horrific grocery store, the “Organic” label can be a beacon to guide you. But what is better than a label is when you are not lost in the food world because you have a guide. After 14 years of guiding and offering food choices for our members, we have built a foundation of trust. And trust is infinitely more valuable than any label can give you. So that brings us to Now. And our now and future will be shaped by one idea, strategic partnerships. I laid out last week how I see the only way to compete with the Global Goliaths, is to be a Local David. 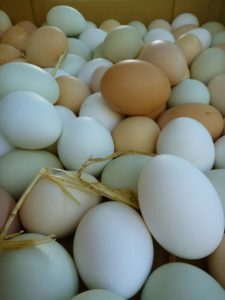 We have to bring you the local voice of not only our farm, but of our community of producers. We all need to be heard and one farm/bakery/ranch floating in the seas by themselves is destined to get lost. A community of producers feeding a community of consumers is the only way we will not only survive in this marketplace, but thrive. Back to Dion’s and Einstein’s. 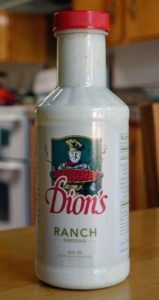 Dion’s is a locally owned company and probably one of the strongest food brands in the state. 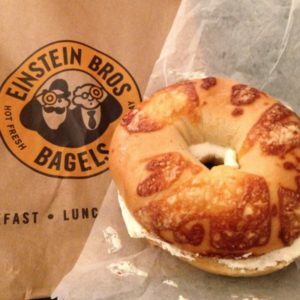 Einstein’s is locally owned franchises and bring us freshly baked bagels daily. I feel these are both amazing companies for us to partner. Look at this week for example; members bought 125 bottles of dressing and 340 bagels! Numbers do not lie and those tell me that our members are happy to see these two new additions. Oh, and each of those orders also had locally grown produce, meats, and/or breads in them. A true win-win for everyone I think. So here is my challenge for you…if strategic partnerships will shape the way our model looks moving forward, do you have or know of a product/business that would be a great fit with our mission? We are always looking for fun and creative people to add to an already incredible team. The last part of all this community-based business planning is in the ownership structure. I strongly feel that a business model that is devoted to the community should be owned by the community as well. I am not talking about a non-profit. I am talking about a for-profit and socially conscious business structure. One in which members of the community can be emotionally and financially empowered to see a local business prosper. I definitely will be An owner in this company, I just do not need to be The only owner. What a last couple of weeks we have had. Very exciting times around here and consequently, for you too. 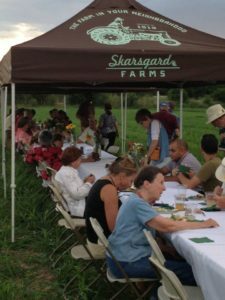 Since the first day (March 2003) that we broke ground on the farm and began this journey to change the local food system, I knew the mission was bigger than one person or one farm. To truly bring positive choices and changes to our New Mexico food culture, we would have to have many seats at the table. In order to change the community, it would take the help of the community. No superhero could make this shift happen. So with Patience (my mom’s name) and Perseverance we have been steadfast to bring you the best flavors that this state and region can offer. Not from one person and not from one farm. But from a curated partnership of local food providers who love this state as much as they love great food. As we build this team of like-minded local producers, we actually build our strength against the Wal-Marts and Amazons of the marketplace. No local company will ever be able to beat them on price. So our goal is not to compete with them, but be the antithesis of them. Do not consolidate products into anonymous face-less packages. But celebrate the local quirks that makes New Mexico so unique. So without further ado, let’s add some new faces to the party. The Burque Bakehouse. 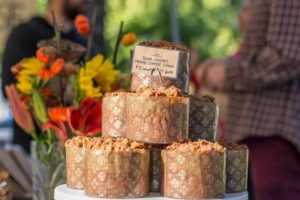 Bringing together the delicate dance between art and science, Pastry Chef Sarah Ciccotello opened her bakehouse and has been a staple booth for many farmers’ markets around ABQ. We are happy to bring Sarah (and husband Chris) on-board with some amazing coffee cakes and banana bread. Look for more of their products to come. Ranney Ranch and the Audubon Society. For many moons now, we have been working with Nancy Ranney and the New Mexico Audubon team to look at how we might educate consumers on the idea of Conservation Ranching. The challenge is straight-forward; can there be a ranch that is a) healthy for land, b) fosters wildlife to use the ranch as a refuge from the over-grazed country side, c) allows cows to express their natural tendencies of roaming and staying with their calves, and d) is financially sustainable to keep the ranch in business and viable? The answer is yes! Fortunately for us. I will go into this system more in depth next week, but for now, I just want to let you know that we will be offering the only grass-fed beef in New Mexico that has earned the Audubon Certification for being a Bird Friendly Ranch. We are happy to be the exclusive provider of the Ranney Ranch beef program. Look for it now on the web site. Einstein Bagels. As I was eating an Einstein’s Bagel a few weeks ago it hit me that we needed to add bagels to our offering. Fast forward to now and we have bagels on the web site. Baked fresh daily and brought to your door. Again, we are the only provider to bring Einstein Bagels directly from their ovens to your home or office. Shmear it on and enjoy. Last but definitely not least, Dion’s Pizza. I have been a huge fan of Dion’s ever since I was in 6th grade and we had a Dion’s across the street from my mid-school. Recently I got an amazing tour of the heart of Dion’s, the commissary kitchen. Whoa for impressive. But something jumped out at me, the attention to food. Cheeses sliced fresh. Dressings made daily. And loaves of bread that take 3 days to make. Dion’s obviously has the scale to outsource so much of their food needs, but they don’t. 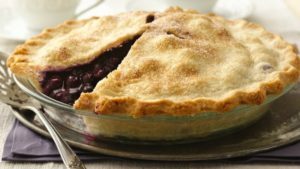 Local chefs, cooks, and bakers are at it 7 days a week to keep the restaurants fresh. We are honored to be the Only place outside of a Dion’s restaurant where you can buy their products. We will start small by offering their three most popular (ok, famous) dressings and have plans to grow/expand from here.